The Virginia Tech Transportation Institute (VTTI) has received a Safe System Innovation Grant from the Road to Zero Coalition to advance its educational outreach to high school students. 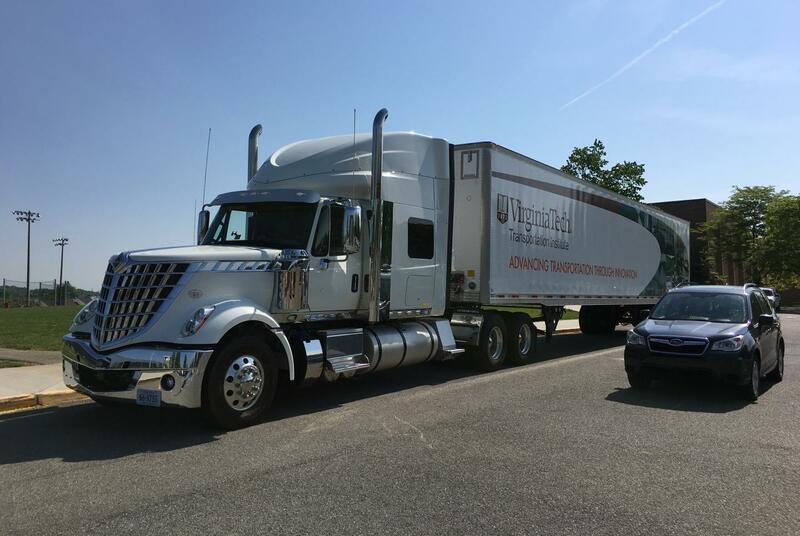 The $169,752 grant will help VTTI to expand its Sharing the Road program, which aims to teach driver’s education students how to drive safely around commercial motor vehicles. Through this funding, researchers in VTTI’s Center for Truck and Bus Safety will visit 15 high schools in the mid-Atlantic region over the course of one year. After listening to a brief presentation, students will rotate through several educational stations around VTTI’s tractor-trailer to learn firsthand about blind spots, proper following distances, and other road sharing tips. They will also be able to take turns sitting behind the wheel of the cab so they can see for themselves the lack of visibility a truck driver has compared to other drivers. “We are incredibly excited to continue our program to educate teen drivers about safely sharing the road with heavy vehicles. With this grant from the National Safety Council, we will be able to provide thousands of additional teen drivers with an opportunity to walk around and sit inside a tractor-trailer. This hands-on experience, which is based on findings from our world-renowned naturalistic driving studies, helps teens understand the dangers of driving in blinds spot around a tractor-trailer,” said Matthew Camden, the project’s principal investigator and senior research associate for VTTI’s Center for Truck and Bus Safety. Additionally, the researchers will create an implementation manual for driver’s education instructors to use to recreate the program. The Sharing the Road program was originally established via a grant from the Federal Motor Carrier Safety Administration. Over the past year, VTTI researchers have conducted interactive safety demonstrations at 25 high schools in Virginia, West Virginia, and Delaware and have received overwhelmingly positive feedback from teachers and students. For more information on “Sharing the Road,” visit https://www.cmvroadsharing.org/. The website provides naturalistic driving video clips, simulator screenshots, scenario descriptions, and other tips to help educate drivers of all ages on proper road-sharing behavior. Call 540-231-1500 if your school is interested in scheduling a demonstration. The Road to Zero initiative was launched in October 2016 as a joint effort between the National Highway Traffic Safety Administration, the Federal Highway Administration, the Federal Motor Carrier Safety Administration, and the National Safety Council. The goal is to eliminate roadway deaths by 2050. The Department of Transportation committed $1 million annually from 2017 to 2019 and an additional $500,000 in 2018 to fund Safe System Innovation Grants, and the National Safety Council is managing the grant process. For more information about the Road to Zero, please visit nsc.org/roadtozero.